The Introduction considers the relationship between Wilde’s education at Oxford and his career as a writer and promoter of the Aesthetic Movement. It provides a survey of scholarship that links Wilde with the field of Classical reception studies and explains the notion of “aesthetic education.” This leads to a discussion of Wilde’s educational background and his plans to pursue an academic career. 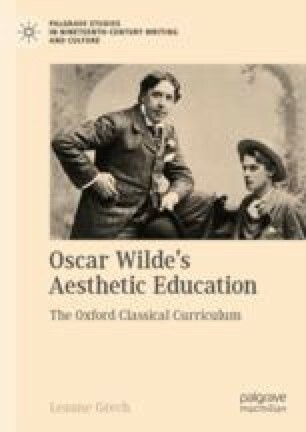 The Introduction reflects on the evolution of the Greats curriculum over the course of the nineteenth century, before turning to the Chapter Outlines, which explain how Wilde’s aestheticism responds to the unique style of Classical education and scholarship that he encountered at Oxford.